Lately I have been seeing lots about Graze snack boxes, and thought I would give them a go myself. Basically, Graze is a subscription service which will send you four snacks in a post box friendly size box either weekly or fortnightly. What I find great about Graze, is the variety and the freedom of choice in what snacks you receive in your boxes. When you first sign up to Graze, you have the choice of three different box types- Variety, Light, or Protein. I chose the Variety box. 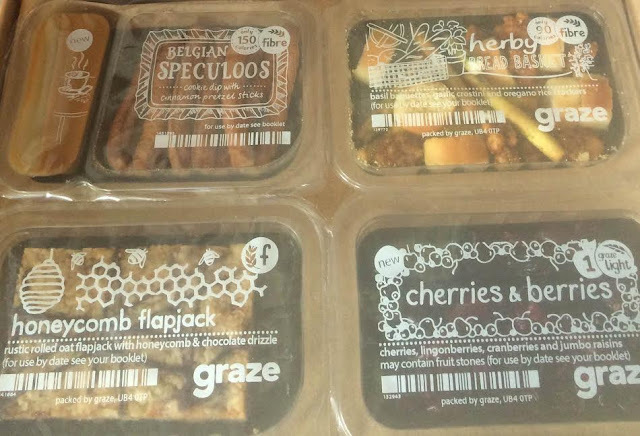 I've only tried two snacks of which I received so far, Cherries and Berries and the Honeycomb Flapjack-both were very yummy! Once you have selected what type of box you would like to receive, you then get given a huge list of over 100 snacks in which you can decide whether you want to 'bin, love, try, or like'. If there are snacks in the list you're not so keen on, or if there's something totally up your street, you can decide what makes an appearance in your boxes, it's completely your choice. Of course what you receive in each box out of the list is a surprise, unless you really want to know before your box arrives, then you can log into your account and find out. My first box was half price, and then after that has gone to the full price; however, I think its good value for money for what you receive. What's also great is the fact that if you're going away, you can snooze boxes until when you need them again- and you'll only pay for the boxes you receive. Let me know if you've tried Graze, and what your thoughts are? My dad occasionally gets a Graze box on the train which he brings home for us. They have some tasty snacks! I love the Graze taster boxes that they have on the counters of supermarkets now, the protein power one is delicious! They're great to snack on, very tempted by a subscription now.